Martin Votruba (1948-2018) – Slovak American Society of Washington D.C. It is with a heavy heart that I announce the passing of an outstanding teacher, dear friend and esteemed colleague, Professor Martin Votruba. He served as the Head of Slovak Studies Program and was a Senior Lecturer at the University of Pittsburgh (Slavic Department, Dietrich School of Arts and Sciences). Many considered him to be the country’s leading scholar on Slovak culture. Martin died on November 23, 2018 after a short bout with lung cancer, even though he never smoked. Martin assisted in sending many of his students to study Slovak at Studia Academica Slovaca, the Slovak language summer school at Comenius University in Bratislava. The University of Pittsburgh is the only university in the United States that offers a Slovak studies minor. Martin was born the son of Radomír and Viera (Nepožitková) Votruba on March 6, 1948 in Brno, Moravia, then part of Czechoslovakia, but spent his childhood in Vyšné Hágy, not far from Štrba, in the High Tatra Mountains. 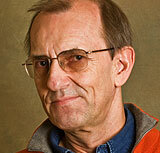 He received his MA in 1973 and his doctorate in 1983 (CSC) from Comenius University (Bratislava). Between degrees, he pursued further studies at the University of Edinburgh, Scotland, where he received a diploma in English Studies (FS, 1980). As a teacher and scholar, he specialized in Slovak studies — its language, history, literature, culture, Slovak and West Slavic linguistics, and Communism and its collapse in Central Europe. His working career began as an Assistant Professor at the Institute of Translation and Interpretation in Bratislava, Slovakia (1973-1974) and continued at Comenius University, Slovakia (1974-1985). Then he decided to defect to the West, and a friend assisted his escape with false documents. He nonchalantly crossed the border and eventually made it to Germany. After leaving Czechoslovakia, he served on the editorial staff of the Ornciment Quarterly (Los Angeles,1985-1988) and as an editor for Radio Free Europe (Munich, Germany, 1988-1990). The University of Pittsburgh appointed him to the newly established Slovak Chair of the Slovak Studies Program, where he remained since 1990. At Pittsburgh, Professor Votruba taught an array of courses on Slovakia and East Central Europe, including Slovak language at all levels; Slovak History and Culture; The Year Communism Crumbled; Slovak, Czech, and Central European Cinema; and a Slovak Transatlantic Cultures course, which included Slovak immigration. He built the largest collection of Slovak films outside of Slovakia and arranged showings for the public. Professor Votruba became the lynchpin of the Slovak Studies Program and left a lasting legacy. Together with Christine Metil, he started and organized the ongoing Slovak Heritage Festival, which is always held on the first Sunday in November each year. He designed the festival so that it would appeal to the general public — folk dance groups, musicians, exhibits, and, of course, Slovak foods. But he also included scholarly lectures for those interested in more in depth information on various topics of Slovak culture. In addition, every year he organized an annual spring event, The Thomas Kukučka Memorial Lecture, which brought to the university a prominent scholar to speak on a topic related to Slovak culture. Votruba himself often lectured at the Department of State in Washington, at academic conferences, and elsewhere on Slovak topics. Professor Votruba served as a member of a number of significant institutions: Board of directors of the Academia Istropolitana, Bratislava; Evaluator of Berlitz transactions Superior vena cava syndrome, Los Angeles, since 1990; the Slovak collection committee of the Western Pennsylvania History Society, Pittsburgh, since 1990; a certified tester for the Slovak and Czech languages for the Interagency Language Roundtable protocol and training carried out by the American Council on the Teaching of Foreign Languages (ACTFL) in conjunction with the Defense Language Institute. He also belonged to several scholarly organizations, including the Modern Language Association and the Slovak Studies Association. Professor Votruba received numerous awards and commendations: American Association of Teachers of Slavic and East European Languages Excellence in Teaching Award (Post-Secondary), 2011; Best Academic Article Bi-annual Prize, Slovak Studies Association – Association for Slavic, East European, and Eurasian Studies; the Milan Hodža Award of Honor, from the Slovak Academy of Sciences, 2014; Letter of Commendation for “dedication to education and to the preservation of the Slovak culture in the community,” Mark Doyle, Member of Congress of the United States; Letter of Commendation for “educational and instructional merits and commitment,” Office of the Chief Executive, County of Allegheny; Education Award “in recognition and appreciation for dedication and service to preserve and enrich the Slovak culture,” Western Pennsylvania Slovak Cultural Association; Medal of Honor, Ambassador of the Slovak Republic to the U.S.; Faculty Honor Roll “in recognition of dedication to excellence in education,” University of Pittsburgh; Letter of Commendation “for positive interaction with students,” Vice Chancellor for Student Affairs, University of Pittsburgh. Martin Votruba was a true friend, a master teacher and an invaluable colleague, and a genuinely kind and helpful person; he will be sorely missed. The many students who studied under him will all remember him as one of the best teachers, one who cared about serving others. On a personal note, he was always promptly willing to assist me if I had any questions about Slovakia or the Slovak language. We always spoke and communicated with each other in Slovak, whether by e-mail or in person. Finally, Professor Votruba built a wonderful website with information about Slovakia, which answers many commonly held questions and includes some useful references. It often comes up in internet searches about Slovakia. He combined a smooth English writing style with his wealth of knowledge about Slovak culture, history, and the Slovak language. This entry was posted in General News, Obituaries, Speakers and tagged Slovak studies, Votruba.